Syracuse University’s Remembrance Week 2012 will be held on the SU campus Oct. 21-27. The weeklong series of events honors the 270 people—including 35 students studying abroad through Syracuse University—who lost their lives in the terrorist bombing of Pan Am Flight 103 over Lockerbie, Scotland, on Dec. 21, 1988. During Remembrance Week, pencil-and-ink sketches of the 35 student victims will be displayed in the Hildegarde and J. Myer Schine Student Center Atrium. Posters of the 35 students will also be displayed at various locations throughout campus through Dec. 21. The Pan Am Flight 103 Archives will present “Dark Elegy.” This exhibit was originally sponsored by the Remembrance Scholars in 2003 “in an attempt to make the … work accessible to the students, faculty and those connected to Syracuse University …” The exhibit consists of seven framed photographs of the sculpture garden “Dark Elegy” by Suse Lowenstein. “Dark Elegy” consists of 75 larger-than-life pieces, each of which portrays a woman at the moment she learned her loved one had died in the bombing of Pan Am 103; Lowenstein lost her 21-year-old son Alexander. Lowenstein says of “Dark Elegy”: “This sculpture needs no language; it is understood by all. It is not political in any partisan sense. It knows no borders. Today, people all over the world are affected by terrorism.” “Dark Elegy” has been dedicated by Lowenstein to all victims of terrorism. The exhibit will be installed in the Noble Room of Hendricks Chapel from Oct. 19-Dec. 21. For more information on “Dark Elegy,” visit the archives’ website at archives.syr.edu/panam/su/pa103_su_dark_elegy.htm and www.darkelegy103.com. All week—An SU Abroad photo contest exhibit will be on display in the Panasci Lounge in the Schine Student Center. Over the past several weeks, students (both SU and non-SU) were invited to take a creative picture—including the symbolic dove of peace—somewhere abroad. The top 35 photos will be a part of the exhibition. 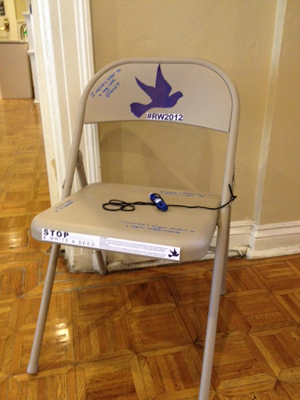 An installation of 35 empty chairs on the Kenneth A. Shaw Quad and in campus buildings will juxtapose the visual representation of the 35 students lost with recently enacted good deeds inscribed on them. The installation is meant to serve as a reminder of how a lost past can inspire positive actions in the present. Members of the University community are invited to submit good deeds they’ve done in an effort to act forward via e-mail, Facebook or the hashtag #RW2012 on Twitter. Sunday, Oct. 21—Remembrance Scholars and SU Physical Plant staff will build a memorial cairn, a traditional Scottish marker of remembrance, on the Quad beginning at 8 p.m.
Monday, Oct. 22—Marsha MacDowell, professor of art and art history at Michigan State University, will speak on “Piercing Peace: Quilts as Visual Discourse of Conflict, Reconciliation and Memory” as part of the Syracuse Symposium. Co-sponsors are the Hendricks Chapel Quilters and the Department of Anthropology. 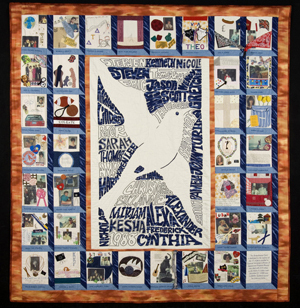 The Remembrance Quilt, a memorial of the Pan Am 103 tragedy, was created by the 1998-99 Remembrance Scholars with the assistance of experienced quilters and other members of the University community. The quilt features a square for each of the 35 SU student victims. A candlelight vigil will be held at 8:30 p.m. on the steps of Hendricks Chapel. Tuesday, Oct. 23—Ed Galvin and Cara Howe, archivist and assistant archivist of the Pan Am 103 Archives, will host a Staff to Staff session on the Pan Am 103/Lockerbie Air Disaster Archives and the collections housed there. Visit humanresources.syr.edu/staff/nbu_staff/s2s.html#GE5 to register. Wednesday, Oct. 24—A screening of the “As It Happened” documentary on Pan Am 103 will be held at 7 p.m. in Kittredge Auditorium in Huntington Beard Crouse Hall. Thursday, Oct. 25—A Celebration of Life concert and poetry reading will be held at 7:30 p.m. in the Jabberwocky Café in the Schine Student Center. Friday, Oct. 26— The Pan Am 103 Archives will be open to the public from 9 a.m.-1:30 p.m. in the Spector Room, located on the sixth floor of Bird Library. The Remembrance Scholars and Lockerbie Scholars will lay roses at the Wall of Remembrance at 2:03 p.m. during the annual Rose-Laying Ceremony in honor of, and to pay tribute to, the 35 SU students and the 11 victims from Lockerbie. This annual ceremony is held at the exact time the disaster occurred on Dec. 21, 1988. The annual Convocation for Remembrance Scholars will be held at 3 p.m. in Hendricks Chapel. A reception will follow in the lobby of the Heroy Geology Building. For more information on Remembrance Week activities, visit remembrance.syr.edu on the Web, /SURemembrance on Facebook and @SURemembrance on Twitter.